I grew up in Holladay, Utah in the 1980’s as a member of a pretty conventional Mormon congregation. In my 9th grade year, a new family moved into the neighborhood and a 10th grade boy (I’ll call him Doug) from that family began attending our Teachers Quorum. Doug and I shared common interests in sports and music and quickly became friends. I recall many evenings shooting baskets in his driveway with Molly Hatchet blaring from the car stereo in the carport. I visited Doug’s home a few weeks after meeting him at church and met his mom. She was nice to me but seemed an otherwise unremarkable woman. I asked Doug about his dad and he told me his mom and dad divorced when he was a kid. His dad worked in the Las Vegas gaming industry and he rarely saw him. He didn’t seem to want to talk about it further so I did not press him. After a few more visits to Doug’s home, I realized there was another adult woman living there. Over time, I learned that the woman and Doug’s mom were a couple. My 14-year-old Mormon boy self had no frame of reference for “lesbians” so I just kind of rolled with it. I got to know them better and found them to be considerate, caring, pleasant people who were as dedicated to raising a good son as were any of my other friend’s parents. 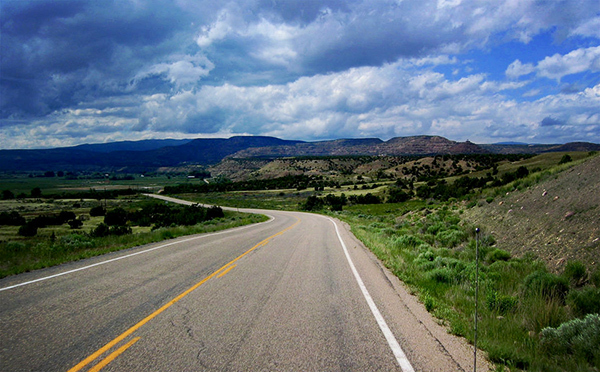 Last month as we were driving home from a wedding reception in Heber City, Utah, our front tires started making a strange noise. We have had tire air pressure issues (thanks to the stainless steel rims Lexus brilliantly selected for our car), so I stopped at a gas station in Kimball Junction to add some air to both front tires. We got back on the freeway headed to Salt Lake City but the noise persisted and even got worse. I slowed down, sped up, changed lanes, and we kept hearing this thud-thud, thud-thud, in rhythm to the rotation of the tires. Howe’s famous exposé was the first of its kind, with information woven together from previous news articles and some thirty affidavits he and others collected. He lived and worked in Painesville, Ohio, where, in 1829, he had published about Joseph Smith’s discovery of a “golden bible.” Smith’s decision to relocate in nearby Kirtland sparked Howe’s attention. Of even more concern was that Howe’s wife and other family members had joined the Mormon faith. Howe immediately began investigating the new Church and formed a coalition of like-minded reporters and detractors. By 1834, Howe had collected a large body of investigative material, including affidavits from Smith’s former neighbors in New York and from Smith’s father-inlaw in Pennsylvania. Howe learned about Smith’s early interest in pirate gold and use of a seer stone in treasure seeking and heard theories from Smith’s friends, followers, and family members about the Book of Mormon’s origin. Indulging in literary criticism, Howe joked that Smith, “evidently a man of learning,” was a student of “barrenness of style and expression.” Despite its critical tone, Howe’s exposé is valued by historians for its primary source material and account of the growth of Mormonism in northeastern Ohio. I hope the following interview generates some interest in this new book. Visit Signature Books to purchase this and other important titles they've published. Seattle Jon: Why reprint Mormonism Unvailed? 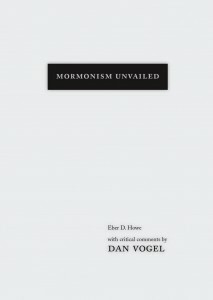 Dan Vogel: Published in 1834, Mormonism Unvailed is rare and for many years students of early Mormon history have relied on poor photocopies, and because of its significance as the first book-length response to Joseph Smith and the many valuable documents it contains a scholarly edition is not only justified but long overdue. SJ: Did E.D. Howe misspell the title of his book? DV: Contrary to what many people assume, unvailed was the preferred spelling at the time. 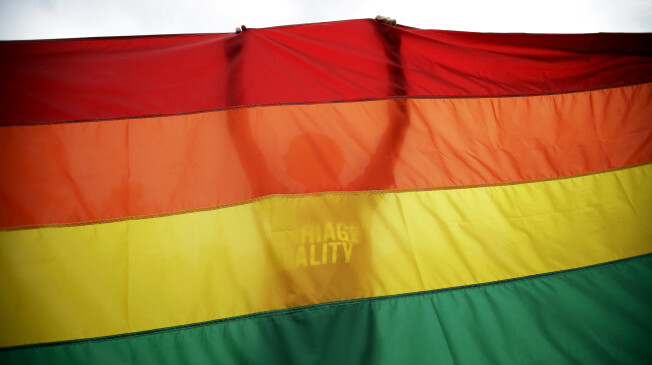 SJ: Why was Howe interested in Mormons? DV: Howe published a newspaper in Painesville, Ohio, located about ten miles east of the Mormon capital in Kirtland, which made the topic of Mormonism unavoidable, and even more so when his wife and sister became converts. SJ: Howe's tone is one of bitterness - why should we listen? DV: Howe’s tone is definitely critical, and at times sarcastic and disdainful, but that was generally the style of newspaper editors in that day. There was no pretence of being objective. One should be equally suspicious of believers. Historians use multiple sources to cut through bias, which is what I try to do in the footnotes that accompany this volume. SJ: I found that the first half of Mormonism Unvailed is about the Book of Mormon and the second half is about affidavits. Which part do you feel is more important? DV: I would say the affidavits of former neighbors and relatives of Joseph Smith are probably Howe’s most important contribution to Mormon studies. SJ: The woodcut cartoon at the front of the book depicts a disguised Moroni with a monkey (the gold plates) in a box. Is there any earlier mention of Moroni as the modern caretaker of the gold plates? DV: This was apparently the earliest published reference to Moroni as the caretaker of the plates. Oliver Cowdery was next in April 1835 in the Messenger and Advocate. See page 134 note 17. Seattle Jon is a family man, little league coach, urban farmer and businessman living in Seattle. He currently gets up early with the markets to trade bonds for a living. In his spare time he enjoys movies, thrifting and is an avid reader. He is a graduate of Brigham Young University and the Japan Fukuoka mission field. He has one wife, four kids, two cats and four chickens. We are a family of pacifists by any stretch of definition; my husband, 6’4” and 300 pounds, has never hit anyone in his life. I got in a fight in fourth or fifth grade when another girl called me an egghead. Otherwise, nothing. Our laid back, quiet family is such that our first son, Cole, spent his early years confused by kids who were aggressive on the playground. 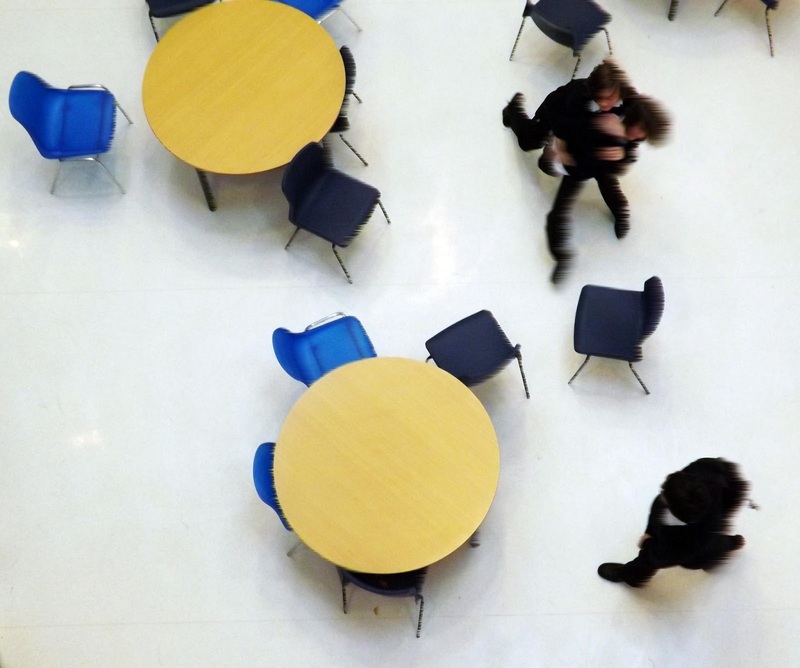 It was so outside his experience that he’d come back, flabbergasted, asking why a person would push him. Cole’s in third grade at a school focused on science and engineering. It’s a public school but a specialized one. He loves it and I love that they are all a bunch of nerds running around together, oblivious to the fact that not everyone talks about computer coding while playing soccer. A few days ago I got an email from Cole’s teacher. There had been an incident. The kids were standing in line to go to lunch when Girl behind my son started punching him in the back. In his version, “I told on her,” he cried, life went on. At the end of the day, Girl came over to apologize; Cole was sitting down, she stood above him, said sorry, then gently slapped his face. Immediate thoughts as I read this email with several hours left in the school day: should I go get him and rescue him? Can this Girl be disappeared? Then, almost as quickly, have I done something to make my son a target? Perhaps you've seen this epic video. And because Shia was filmed in front of a green screen, perhaps you've seen some of the hilarious backgrounds Mr. LaBeouf has been dropped into (a few of my favorites here, here and here). His mantra to "just ... do it!" also couples nicely with Spencer Kimball's famous phrase to "Do It." If there are any editing wizards who read the blog, we'd love to see some LDS backgrounds - send em in and we'll post. Seattle Jon is a family man, little league coach, urban farmer and businessman living in Seattle. He currently gets up early with the markets to trade bonds for a living. In his spare time he enjoys movies, thrifting and is an avid reader. He is a graduate of Brigham Young University and the Japan Fukuoka mission field. He has one wife, four kids, two cats and four chickens (now dead). A. The age of the Apostle. The youngest Apostle is David A. Bednar, who turns 63 in a couple weeks. Any Apostle they call that's younger than him, they're calling with the knowledge that the likelihood's increased that this man could be a future President of the Church. No man has been President of the Church who wasn't an Apostle by the age of 51. Monson was 36. I should mention the ages when called of Oaks (51), Holland (53), and Bednar (52). B. The length and position of service. They'd want someone who's been a General Authority for a while, with a preference for those in the Presidency of the Seventy. 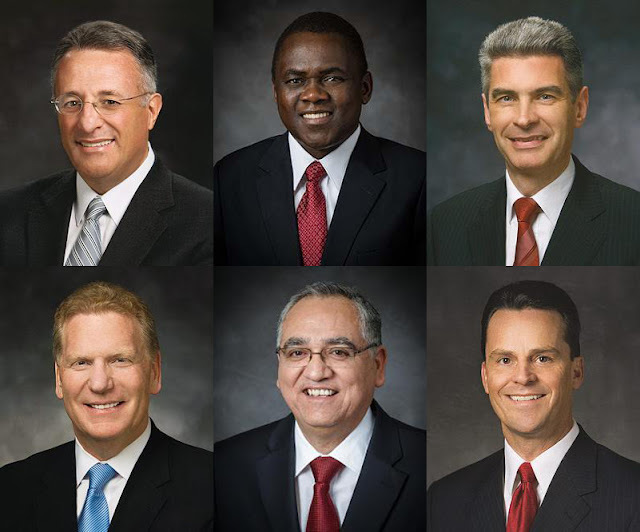 Six of the last ten Apostles called had been in the Presidency of the Seventy. C. Race. The Church just feels way overdue for a non-white Apostle. It's never had one. Other than Dieter F. Uchtdorf, there's hasn't been a non-American Apostle since the days of Pres. Heber J. Grant, when he called John A. Widtsoe (Norway) and Charles A. Callis (Ireland). 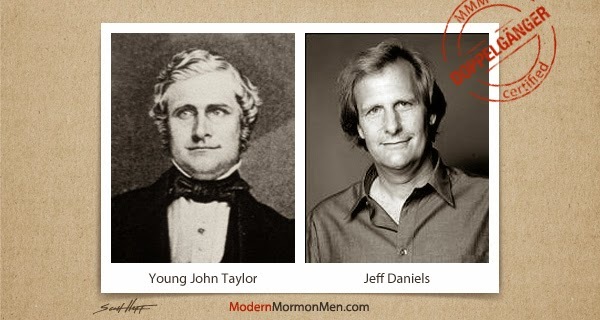 Young John Taylor looks a lot like Jeff Daniels. They both sing. They’re both woodworkers. They were both Methodists at certain points in their lives. Jeff Daniels has three kids—named Ben, Lucas, and Nelly. John Taylor fathered 34 children—I’m just going to assume there was a Ben, Lucas, and Nelly in there somewhere.